Cincinnati was interesting but not enough to stay. *g* I'm home again for less than a day then heading northeast if I can dodge the storms. Saturday Mom and I are attending the knitting Lace Faroese-Style Lace Shawl Midwest Masters class in Neenah with Myrna Stahman. I'm looking forward to the class and I hope my lace knitting (especially Forest Canopy) will get a boost from a day of instruction. Nora, you might be interested her bio! I'm also picking up my new loom after class. ::bounce:: I really need to clone myself. Realistically, I should investigate ways to better schedule my time (also known as "step away from the computer, Mrs. Simon!"). I want to do everything. Suggestions? 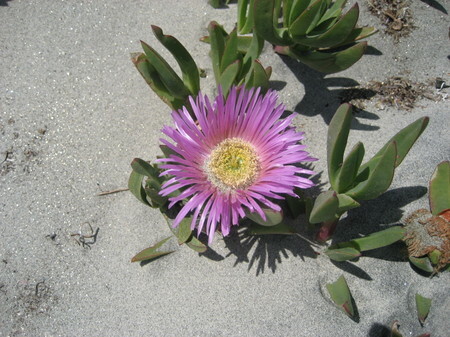 As a reminder of a lovely vacation, here is a flower from the beach dunes at San Diego. I was enjoying my morning coffee and reading my bloglines when I found this nifty YouTube video of Cat Bordhi explaning Judy Becker's Magic Cast-On. I'm posting it today, first, because it is so cool, and, second, so I won't forget it. (Yes, it is a sad state of affairs this growing older, but you find ways around it.) Cat Bordhi has several other videos posted so I'll be able to see what I've read in her books. Thanks, Cat Bordhi! Thanks to Bonne Marie Burns for posting the link in her sidebar!